Yeah, the notion that the original Sabre "didn't work" is absurd; It was one of the besting selling and longest on the market main canopy designs ever. Certainly it set the standard in its day. Personally, I have around 2000 jumps on Sabres, all with no modifications. USPa jumpers in Europe - 3rd party insurance? Never had a BPA temp membership, never had to pay for anything extra related to insurance, was allowed to jump with USPA. I can't speak what is required versus what is enforced in any country. It has been a couple of years since I've been in Europe however, maybe things have changed in some locations. I've jumped in the UK, Germany, France, Netherlands, Spain and Belgium. I've never had an issue with USPA or had to buy additional insurance. "...Skydive Arizona does have a lot of guidelines because we have a lot of visitors from drop zones that apparently don't." Thanks Bryan. I find it absolutely astonishing that this is still the case, but it is. I travel to different drop zones fairly often and even the basics, such things as pattern or landing direction, are not well explained or adhered to at some locations. I also try to avoid some boogies because of the "jungle rules" that seem to apply to canopy flight. Eloy does a great job with this issue and, as an annual visitor, I appreciate what you guys do. First, congratulations to all. This is an enormous step forward as a discipline and this team will likely be remembered as pioneers in wingsuit competition (along with other national teams at the meet) long after many of us have moved on. We will be cheering you on from afar! What Spot did not say is that he was also selected by USPA as Team Manager for the U.S. Team. Well deserved and thanks for your contributions to making wingsuit competition an internationally recognized event! 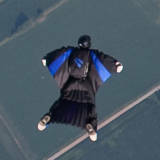 WHO was a good friend and, from a personal perspective, it's sad to see his skydiving memorabilia being sold on ebay. Skydive Chicago or Chicagoland Skydiving Center are the nearest full time turbine operators...about a 4 hour drive from the STL metro area. Great article DSE! Thanks! I look forward to your comparison of the Sony and GP3.